joy magnetism: Oh, how nifty, look who's 50! Happy birthday, George Clooney! Oh, how nifty, look who's 50! Happy birthday, George Clooney! 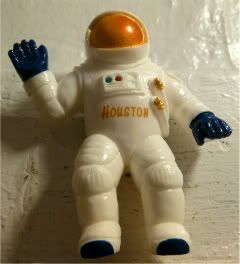 I love this Houston magnet - totally bought it in the Houston airport, though I'm wishing that one space store had been open, cuz I think they would have had such cooler magnets. Like a NASA one that says, It's not Rocket Science (except that it is)! Eh, maybe next year. Anyway, I'm using this magnet today because it's the closest magnet I had at the ready for George's birthday. Ya'll know how much I love my boyfriend. But, I will readily admit: I totally fell asleep during Solaris. I'm sorry, George. Do you hate me? Please don't. I've watched all of your other movies and own them, too. Including Red Surf. And dude, I oughta get a medal for that one. Omg. Shoulda been called Solarizzzzzzzzzzzzzzzz. Hahahah, I wish I could Like your comment. So. True!